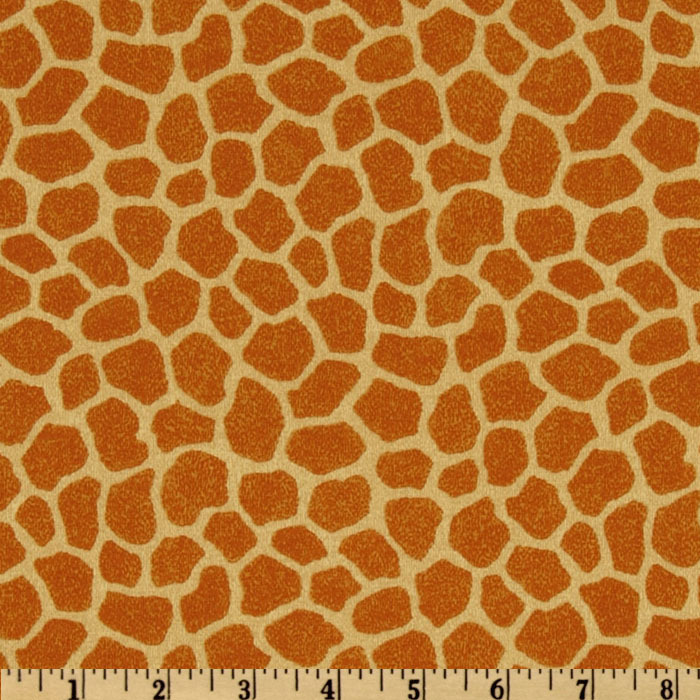 The author based this giraffe pattern on a collage I made out of vintage paper. 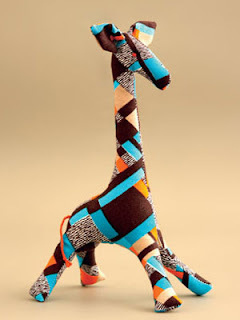 After being inspired by other "giraffe makers,” I decided to turn the design into a three-dimensional toy. This is the result. • Body fabric – a 30 cm × 40 cm (12 in × 16 in) piece of patterned fabric for the body, and a 20 cm × 25 cm (8 in × 10 in) piece of the same fabric for the gusset and ears. • Thread – colored sewing thread to match fabric; embroidery thread or yarn for the eyes and tail. 2. Pin the 2 body shapes together (right sides facing) and sew from A to B, around the back, neck, and head.1. Trace and cut out the enlarged pattern using the template provided. Pin it to the fabric and cut out the pieces. You will need to cut 2 body shapes, 1 gusset shape, and 4 ear shapes from your fabric. 3. Pin the gusset piece to the body piece, A to A and B to B (right sides facing). Sew together, leaving an opening for turning right-side out and stuffing (as marked on the pattern). Clip all curves close to the stitch line to allow for a smoother finish after turning right-side out. Turn right-side out. 4. Using a stuffing stick, carefully push small amounts of stuffing into the tight corners first – nose, neck, and legs. Gradually fill the rest of the body until the stuffing is firm and even. Hand-sew the stuffing opening closed using a whip stitch. 5. For each ear, pin 2 pieces together (right sides facing), then sew, leaving the straight edge open for turning right-side out. Turn right-side out. Turn the raw edge under 6 mm (.24 in) and hand-sew the opening closed using a ladder stitch. Position the ears on the head (as marked on the pattern), folding each slightly at the base, and attach with a ladder stitch. 6. To make the tail, cut three 6 cm (2 in) lengths of embroidery thread or yarn. Attach them to the seam at x, then braid the threads together and tie a knot at the end (see photo on this page). 7. Use embroidery thread to sew the eyes, as follows: Insert the needle at y and push it all the way through the head, coming out on the opposite side, then make a stitch and push it back through the head. Go back and forth through the head a few times so there are several stitches for each eye, pulling the thread tight each time to make the eyes indented. Tie off and hide the thread in the body.